I actively despise board games that seemingly toss out all the social and interactive aspects of the medium. Some of the absolute worst gaming experiences of my life were spent around a table endless doing the same futile task over and over again, with only social norms keeping me glued in my seat. Two popular genres, deck-building games and work-placement games, fall into this category and make me an outcast among many tabletop gaming groups. I find games like Seven Wonders, Dominion, and Agricola painfully boring. These games tend to isolate players, allowing only minimal interaction between players. These games can feel like group solitary, each player focusing on their own strategy and generally ignoring the rest of the table. Actual human contact is rare in videogames and I would much rather engage in social play and deceit at my board game table than formulaic and lonely strategizing. This is the attitude a carried with me into my first game of Ascension, a deck-building game not unlike Dominion. Much to my surprise, I became smitten with the game and its expansions. With a few significant design decisions, Ascension has managed to salvage the deck-building genre. To give a brief explanation, Ascension is like competitive hunting while Dominion is like the stock exchange. Both games give players a deck of cards they can use to acquire cards from a set of communal piles to further augment their deck. As the game progresses, players hone their decks into efficient machine to rack up points and secure a victory. There are a few key differences between the two. In Dominion, the final score is tallied based upon the value of cards in each players deck. 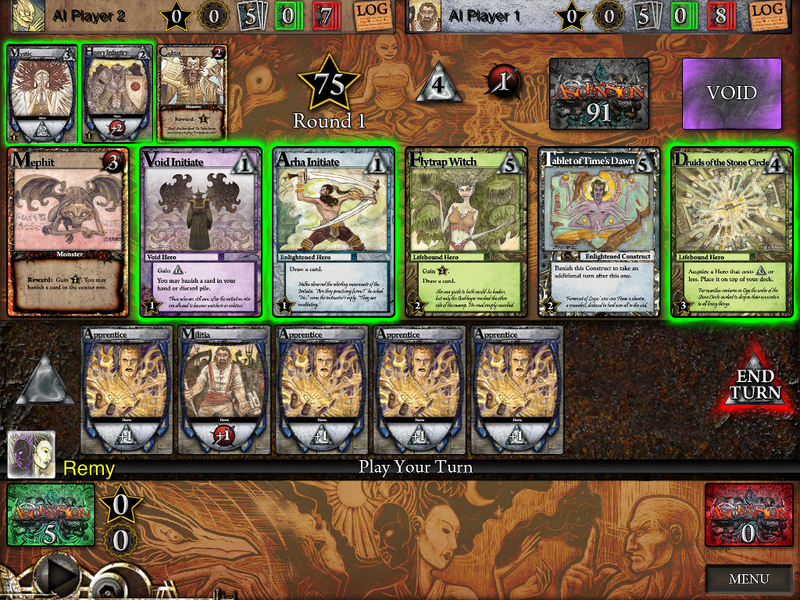 Ascension distributes the same way, but also allows players to destroy monster cards in the center tableau. With few exceptions, destroying these cards gives players special bonuses that affect opponents directly or change the cards available in the center piles. Additionally, unlike Dominion, the center cards change constantly. While players may always purchase or destroy a few select cards whenever they want, all other cards are replaced randomly from another deck. This means if you miss the opportunity to purchase a card immediately, the chance to grab that card may never come up again. The result of these features creates a game that is far more responsive to play decisions and therefore increases the level pf player interaction dramatically. Yes, Dominion also includes a level of denial when players snag up all the cards their opponent wants, but the actual effect is so much more realized in Ascension. In Dominion, buying a card to stop an opponent from getting it will likely water down your own deck, letting other players around the table to free-ride on your sacrifice. The banishment feature, which allows you to remove cards from the center row or your own deck allows players to make decisions more offensively. Many cards also banish constructs from play, stopping their owners from gaining the benefit of the persistent value of that card type while also watering down the deck's efficiency. Most importantly, Ascension allows players to react far more responsively. Many cards allow players to interact with their deck - banishing cards, replacing cards, or drawing new ones - which means changing strategies mid-game is less punishing. Games can change dramatically quite quickly. Of course abandoning your initial plan entirely is a terrible ideal, but the game overall feels more responsive and lively. 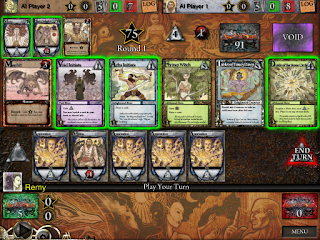 If I am playing with one person or four, when playing Ascension, I never feel alone. Above all else, this feeling of a shared experience elevates Ascension well above its minimally interactive counterparts. Ah, I picked this up a while ago when it was 99 cents really loving it. Although for interaction related dominion types, have you looked at puzzle strike on fantasystrike.com ? While it doesn't offer the denial aspect it often does has a decent bit of player interaction mainly through it's core win condition, crash gems which create their own great risk/reward aswell.